In order to reach a high level of rigor with the common core standards you have to use the Math Practices. The standards are the concepts to be taught and the Math Practices are the how and why. My purpose behind this activity is to develop good work habits and to give the students an organizational tool, at the same time getting them looking for math all around. In Math Practice 1 students "monitor and evaluate their progress and change course if necessary." I understand this is relating to a single math problem but I am taking it to a broader sense of creating a portfolio of work to be evaluated. I've included a copy of the Math Practices and Classroom Observations from Inside Mathematics that I have been using to guide my curriculum. To begin this lesson I open by asking my students "Why is it important to be organized with your math work?" I give some wait time for students to think about the question and then ask them to discuss the question at their tables. As I walk around I overhear discussion, I am also checking in on my students level of understanding about being organized. This gives me some indicator of how well they are going to be able to keep a portfolio of work or if I need to collect the work. I found out that I would need to be collecting the portfolio papers this year. I had overheard some students talking about how they would keep their desk clean by throwing away lose papers and others saying they don't like to save their work. I also heard students from two tables talking about how important it was to stay organized in math because then they wouldn't make as many mistakes. I teach a multiage 4th and 5th grade class and I am proud to say these were my 5th graders saying this to the 4th graders. They were trying to make the point that I had last year. You need to be organized in order to be a successful student. Let me make sure I heard this right. To be an organized math student I need to put my papers away in my folder because then I won't lose them. I also need to keep my folders in my desk so I don't take to long to putting them away. Roxey said I want to be organized because that way I can find my papers when I am trying to remember how to do something in math. I appreciate all of the smart, organized math thinkers in this room. After the discussion about math organization, I give each students a large piece of construction paper (12" x 18"). I don't tell them to fold it in half, but I show them. I do this because it creates a pattern where students have to look to me for instructions. I ask students to put their name on the top right corner and to use fancy lettering to label it MATH. 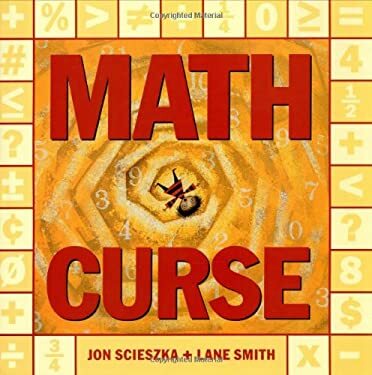 While reading the Math Curse you can have your students decorate the cover of their Math Folder with the math they hear in the story. I use literature in my math to help students understand math vocabulary relevant to 5th grade topics.The literature also gives the opportunity to integrate math vocabulary from several sources such as math text books, direct teaching, discussion, paper and pencil activities and in this lesson literature. I use different Lexile levels for math than I would for reading purposes because my focus is on the math and not a students ability to decode or understand the content. 5th graders are still visual learners and the stories help me connect to diverse learners. The literature literally puts a picture in their heads about the math concept I am teaching. My main objective with this book is to get students thinking about the math that surrounds them everyday and all the time. It also gets the students excited about math and recognizing math is all around them. Brain research states a student will double their retention if they reflect on their learning. You can have our students reflect either verbally or in writing. For this lesson I am working on having students get to know one another, I had them reflect verbally with at their tables. I asked the students one simple question that kept the discussion open. "What did you learn about math today and where can you find math in your everyday life." "I never realized how much math was in my day!" "I'm feeling a little overwhelmed at all of this." And another student responded "You'll get used to it. We read this story last year and I felt the same way but now I love finding math." Six weeks after teaching this lesson and I hear a few times a week - "Math Curse! I found math in....."